Breeds their dogs with an eye to improving their own dogs and the breed in general. Can verbalize why they bred these two dogs. Knows that it is unlikely that they’ll break even after all genetic testing and care of mother and puppies. Breeds no “rare” or “unique” colors. Labradors come in black, yellow and chocolate only. Usually doesn’t have more than one breed of dogs. Often has a waiting list for puppies. 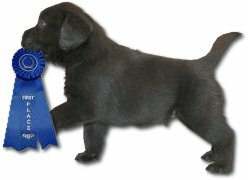 Belongs to at least one breed club to keep current on new information and breed concerns. Does not advertise in newspapers. Puppies sold through word of mouth, because of club/breed contacts. Supplies shot records, pedigrees, AKC registration, care information. Is willing to let you see and visit with the sire, unless the female was shipped to the male. If so, photographs will be available. Tests all breeding stock (OFA, CERF, HEART, DNA, etc.) and has certifications for each. Asks as many questions of you as you do of them (OR MORE). Provides referrals to other breeders if they don’t have anything available. Has no concern about being able to sell a puppy, but rather, cares where their puppy is going.